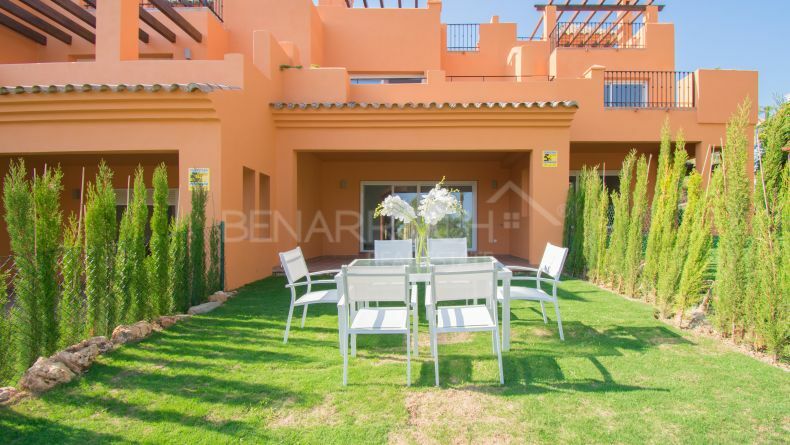 In El Paraíso Alto and to the west of the Atalaya golf course, in a very quiet and consolidated area where medium-sized villas predominate, we find a Mediterranean-style complex, El Paraíso Bellevue, semi-detached houses in Benahavis. The confluence of the municipalities of Marbella, Estepona and Benahavis is a residential area much sought after for its tranquillity, security and the quality of its properties. Its proximity to golf courses such as Atalaya, Club de Golf El Higueral, Marbella Club Golf resort, El Paraíso Golf Club, El Campanario Golf and Country House, Flamingos Golf and Real Club de Golf Guadalmina, makes it a perfect location for lovers of this beautiful sport. Likewise, El Paraíso Bellevue is located just a few minutes from the beautiful and picturesque village of Benahavis, a gastronomic reference in the area for its countless restaurants that offer a varied menu in a calm atmosphere and with the most typical Andalusian air. San Pedro Alcántara, Puerto Banus, Marbella and Estepona are just a short drive away. Also, a few minutes away we have access to several shopping centres located next to the Costa del Sol road, such as El Pilar, Benavista and Guadalmina, with restaurants, cafés, pharmacies, supermarkets, professional offices, banks, which cover the needs of their residents. Paraíso Bellevue consists of thirty-two semi-detached houses of which 14 are members of this last phase in the process of completion. The homes, with three and four bedrooms, have built areas of 127 to 150 square meters, covered and open terraces of 73 to 105 square meters and private garden of 35 to 76 square meters. The semi-detached houses of El Paraíso Bellevue are developed on two floors and a rooftop tower, facing south, in a complex with a swimming pool and landscaped areas. The houses have a functional kitchen open to the living room and open spaces that provide great luminosity, master bedroom en-suite and access to terrace and garden. All homes in El Paraíso Bellevue have two parking spaces in the entrance area, one of them covered with pergola and heather. Benarroch Real Estate offers you all the necessary, updated and reliable information and from our office in the shopping centre El Pilar we invite you to visit us to clear any doubts you may have and to be able to make the important decision to buy in El Paraíso Bellevue, semi-detached houses in Benahavis.